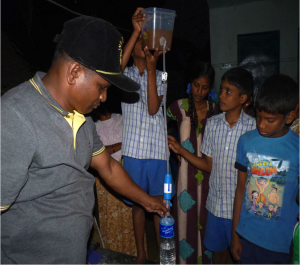 After the November 2015 flooding in Chennai India, local standing water was bacteria ridden, muddy and putrid. There was nothing else available. This photo shows water from ponds outside a housing complex being cleaned during a demonstration in the use of the ZOEN filter. 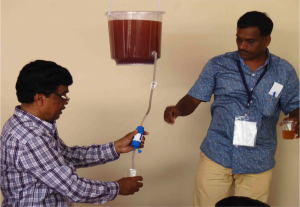 In India, training workshops on the use of the ZOEN filter were given in major centers across the nation by the Water Serve Foundation and its India partners. Here the filter is being demonstrated before groups at a conference numbering 1,100 attendees from city and country areas so they would know of the filter’s availability and understand its use and maintenance. 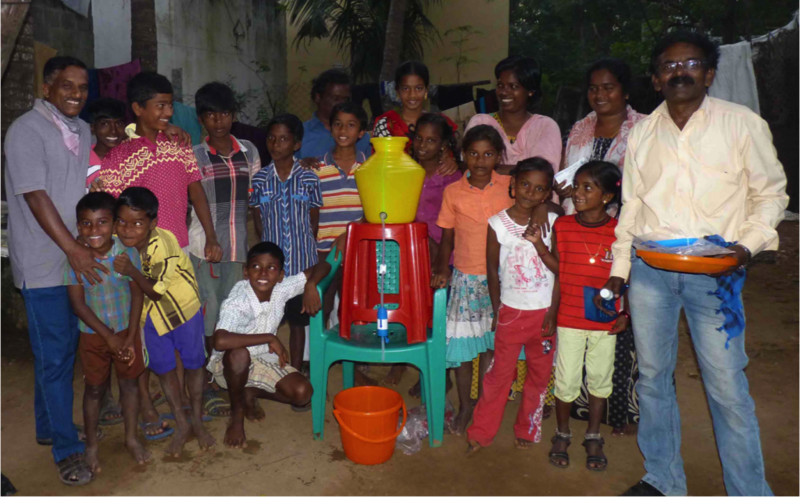 Three families in Chennai, India receive continuous, clean drinking water from a shared ZOEN water filter, after the flooding. Extra water is given away to other people in the community that are in need.